Influenza vaccination. 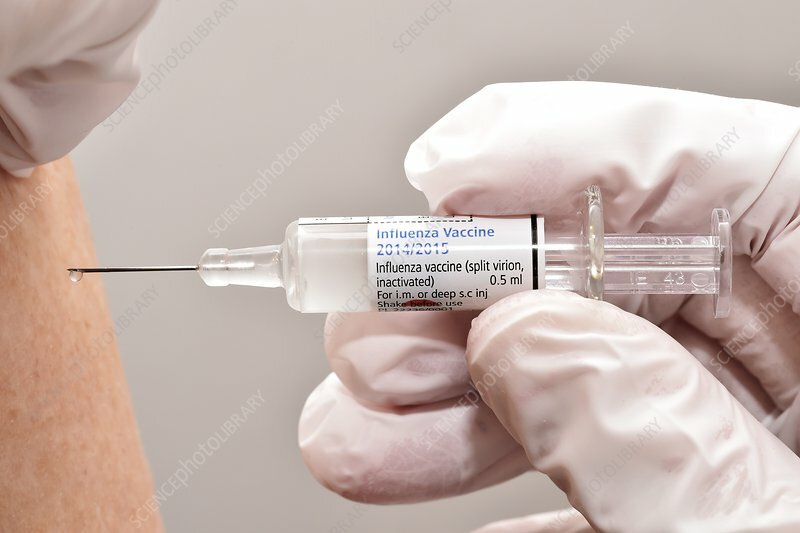 Injection into a patient's arm of the 2014/2015 seasonal influenza (flu) vaccine. This is a split virion, inactivated, vaccine, designed for intramuscular (i.m.) or deep subcutaneous (s.c.) injection. Influenza vaccines contain dead influenza viruses. When injected, these stimulate the body's immune system to produce antibodies that protect against future infection by live viruses. Vaccination is recommended for the elderly, the very young, and anyone suffering from respiratory or circulatory disease. It is provided annually because of the need to protect against new strains.